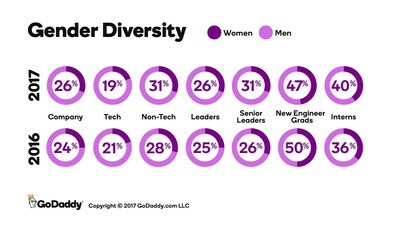 SCOTTSDALE, Ariz., Oct. 2, 2017 /PRNewswire/ -- GoDaddy Inc. (NYSE: GDDY), the world's largest cloud platform dedicated to small, independent ventures, today published its annual diversity and salary parity data. 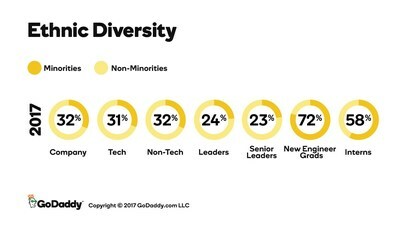 The data shows that GoDaddy is making incremental progress on balancing the ethnic and gender balance across its employee population, especially among the company's women senior leaders, and work remains in order to realize more significant gains. The 2017 data shows GoDaddy has increased the population of women at the company, from 24 percent to 26 percent of the total workforce. Last year, the population of women in GoDaddy's senior leader category lagged so the company made a concerted effort to focus on the promotion process. GoDaddy partnered with the Clayman Institute to develop a new system that enabled the company to proactively identify qualified women – and other qualified candidates – who should be considered for promotion. As a result, women in senior leadership ranks at the company increased 5 percent to 31 percent overall. GoDaddy did see a dip in the number of women in tech roles at the company, which decreased 2 percent to 19 percent overall. 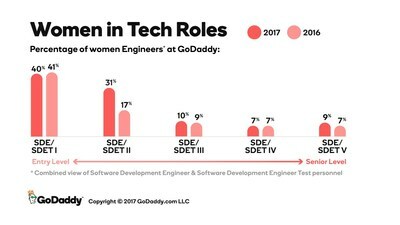 Similar to GoDaddy's 2016 data, a closer look at the engineering ranks shows a year-over-year improvement with women in entry-level jobs, however the population of women in more senior engineering roles is lacking. In 2017, minorities comprised 32 percent of GoDaddy's workforce population, the same as 2016. The 2017 salary data shows that GoDaddy is paying men and women at near parity across the company, when comparing men and women in like roles. The results are similar to last year's salary data. This was the third consecutive year GoDaddy audited internal salary data, analyzing like-for-like roles, comparing how men and women were placed in the salary band for comparable roles. GoDaddy sets its salary bands by role and level, and ranks well in how it compensates its employees against industry averages. 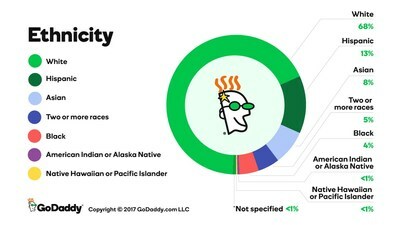 This is the first year GoDaddy analyzed salary data for minorities and non-minorities. The new salary data shows women, overall, make the same amount as men and, in technical ranks, make a penny more on the dollar than men. But men in more senior leadership roles make four cents more on the dollar than their female counterparts. The gap in pay is due to an increase in women being promoted to senior leadership roles over the past year, as described above. Because the women are new to their roles, they are paid less than their counterparts who have been in the roles longer (i.e., all newly promoted employees start lower in the salary band in the new role). The salary data shows that minorities, in technical ranks, make four cents more on the dollar than their non-minority counterparts. Companywide, minorities make three cents more on the dollar than non-minorities. "We know that closing the diversity gaps in technology cannot happen overnight. Companies need to convert their diversity initiatives into cultural bedrock so diversity is the foundation for every facet of the organization," said GoDaddy CEO Blake Irving. "My overriding hope is that our transparency will encourage others to share their insights and help our entire industry improve diverse representation." "The data demonstrates that our commitment to help narrow the gender and ethnic gaps continues to move us in the right direction, but the rate of change is gradual," said GoDaddy Chief People Officer Monica Bailey. "I'm pleased that we're turning the data into actionable plans. Last year's data showed a disparity between the number of men and women senior leaders and, as a result, we deployed a thoughtful plan that generated results. We're doing the same with this year's data. It's proof positive that we can make meaningful change that makes us a stronger organization for our employees and our customers." GoDaddy powers the world's largest cloud platform dedicated to small, independent ventures. With nearly 17 million customers worldwide and more than 72 million domain names under management, GoDaddy is the place people come to name their idea, build a professional website, attract customers and manage their work. Our mission is to give our customers the tools, insights and the people to transform their ideas and personal initiative into success.